The videogame industry, like other computer and tech industries, tends to have a very buzzword-heavy culture. Certain phrases just seem to resonate with game makers, who latch on to them, often overusing or even misusing them. As some people have already pointed out, the new videogame buzzword seems to be “Asymmetrical Gameplay,” or designing games where players don’t all start out on equal footing. Most of this sudden interest is due to the Wii U and its inherently asymmetrical design, with one player operating the gamepad and the other three using the usual Wii remotes. However, other developers are jumping on the asymmetry wagon as well, with games like The Flock, which seems a bit like an online version of capture the flag (or maybe more like “Flag Tag” from GoldenEye). Players having asymmetrical roles is certainly not a new idea. During the middle ages, Hnefatafl, a board game in which the king and his guards are besieged by a much larger force of invaders, was popular in much of Scandinavia. Though it’s not entirely clear how far back the game dates, the Poetic Edda notes that one of the first things the gods did after creating the world was to relax and play some Hnefatafl (which would make it a very old game indeed). Other traditional games like Fox and Geese share this asymmetrical style, with one player controlling a small, but powerful force, while the other player attempts to win with superior numbers. Examples of asymmetrical boardgames are not limited to folk games. Modern authored games take this approach as well. Back in high school, my friends and I played a lot of wargames, from Risk to Mordheim to Kingmaker, though our favorite game by far was Axis & Allies. 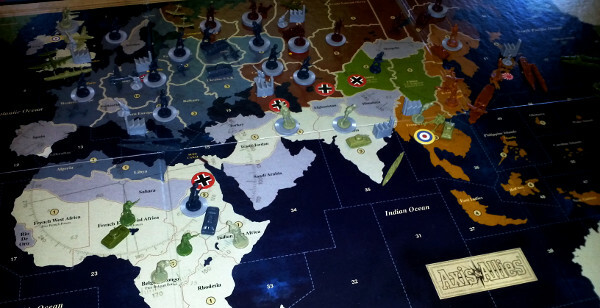 Unlike games like Risk, players in Axis & Allies don’t start with equal resources. Rather, they each take command of one of the major combatants in World War II at approximately the point in history when the United States entered the war. This means that the Russian player begins in a tight spot, while the German player seems almost poised to win the game single-handedly. Although Axis & Allies has some similarities to games like Hnefatafl, it’s not simply another example of the strong vs the many. In fact, despite the Axis players being outnumbered three to two, the most powerful player in the game isn’t Germany, but the United States. While the numbers seem to favor the Allies, in practice, we saw the Axis win just as many games over the years. So how did the designers achieve this balance? Much of it has to do with geography and distribution of forces. The British start with a huge empire, but have few troops to defend it and no way to quickly reinforce them. Germany has a lot of troops and a lot of room to expand, but is wedged between London and Moscow. The US is both wealthy and easily defended, but is so far removed from the fighting that support to its allies often arrives too late to save them. Each faction requires a dramatically different approach to be played effectively. What made this asymmetrical style of play really fun, however, was the dynamic that it created between players. While each team shared a common goal, the best way of achieving it was often a contentious issue. The tension between what was best for an individual player and what was best for the team led to lots of discussions and debates. This tension could also be exploited by crafty players, such as Japan intimidating the US into building a huge stack of infantry to defend California while the rest of the Allies were overrun (although California was certainly safe for the rest of the game). 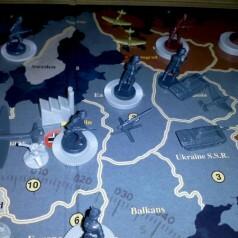 It was this social dynamic that made Axis & Allies so compelling. It was also something that very few other wargames were able to do well. So why don’t we see see this kind of asymmetrical gameplay in digital wargames as well? The short answer is simply that balancing that kind of game is difficult, whether as a tabletop game or a videogame. Most historical strategy games like Civilization or Age of Empires have nearly (if not completely) identical factions, differing only in a few unique units and some special bonuses. An ambitious game might take a more Starcraft-like approach, having fundamental differences between players, but still starting everyone out on equal footing. I’ve yet to find a strategy game that utilizes the extreme player inequalities that you find in Axis & Allies (unless you count the digital version of the boardgame, which was a bit glitchy). This is not to say such a game would be impossible to make, but it does pose a number of problems. For example, our biggest obstacle to playing was that you needed to find five players who were willing and able to play a game that could sometimes last seven or eight hours. 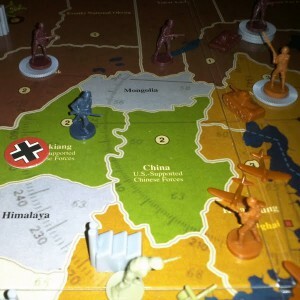 Although the game has rules for two, three and four players as well, you lose a lot of the excitement when one player controls multiple countries. For this reason, we almost always played with the full five. As our friends started going to college and moving away, we started recruiting their younger siblings to take their spots. Videogames can address this problem somewhat by allowing for computer controlled players, though computer players usually face the same issue of not being able to reproduce the same social dynamic as a human player. If trying to design an asymmetrical strategy game is so difficult, why should anyone even bother? I would argue that it’s important today for the same reason it was important when Hnefatafl was first emerging – because war is generally asymmetrical. Although the idea of two identical chess-like armies marching to battle makes for an interesting competition, it results in a more abstract, rather than historical, kind of game. It’s probably safe to say that Hnefatafl was at least partially inspired by an actual battle between the Swedes and the Muscovites (since that’s how the different pieces are referred to in some versions of the game). The Swedes have no hope of defeating the invaders. Protecting their king long enough for him to escape is as much as they can hope. Although we don’t really know the outcome of this hypothetical battle, it was significant enough that the Vikings didn’t want to make stories and songs about the event, they wanted to replay it, experiment with it, and speculate as to how it could have gone differently if they had been there. For me, this is the essence of what makes a historical wargame. Let’s look back at Axis & Allies. At the start of the game, forces and territory are distributed in a way that is, for the most part, historically accurate. Both sides could certainly try to reenact the second half of the war by following the same strategies that were used historically, or the players could engage in a little playful historical thinking, trying to figure out in what other ways the war could have gone. Is a D-Day invasion of France the best path to victory, or could the Allies have simply reinforced Russia and plowed through the Germans lines from the East? What would have happened if the Allies had focused on Japan first, and Germany second? Over years of playing, I’ve seen many scenarios like these, as well as some much more unlikely ones, such as the German Navy sneaking through the Suez Canal and conquering the South Pacific, a massive land war in Asia completely overshadowing the European theatre, and a lone German infantry unit launching a surprise attack on an unsuspecting China. Though it probably did nothing to help any of us remember significant dates or events, it certainly prompted a lot of discussion about how tactics, diplomacy and geography related to those events. Could the same lessons be learned from a symmetrical Risk-like game? Probably not. Although such games surely inspire their own discussions about history and warfare, they are unlikely to reproduce situations like D-Day or the Battle of Stalingrad. In Axis & Allies, these are situations that the players have to think about right from the start. The players’ knowledge of these events helps to inform their choices and the outcome of these choices gives new perspective on the historical events themselves. I like these kinds of games, and I’d like to see more of them, especially on digital platforms. I’m certainly in no danger of growing bored with balanced Civilization-style games. In fact, I think there’s still plenty of untapped potential in them. However, I’m looking forward to someone tackling the challenge of making the next great Hnefatafl or Axis & Allies on a digital platform. I legitimately have a Hnefatafl board and pieces. It’s an excellent game. Also, have you looked into League of Legends? Asymmetrical balance is a core of the design for that game. X beats Y but Y beats Z and every hero has power spikes at various stages of their level and/or item builds. In addition, the gold gathering mechanic further separates players who are performing better than their opponent. Very rarely are two combatants exactly equal in gold, level/experience and item power. True, League of Legends, Starcraft, and many other games have moved away form the 1 to 1 identical gameplay that you get in Chess, toward a more “Rock, Paper, Scissors” kind of balance. Still, I wouldn’t call it asymmetrical in the same way that Axis and Allies or Hnefatafl is. Even though different races/characters are different, you still start out the game exactly like your opponent and, for the most part, evenly matched. In Axis and Allies, Russia doesn’t just have different options than the US, it is barely half the strength of the US and in a far more vulnerable position. I think it would be bit more like if one League player controlled a character, while another could only control the minions. Your point about inequality specifically pertaining to war games is quite relevant–indeed, it is nigh impossible to find a realistic example of two identically matched forces to do battle with. To accomplish asymmetrical gameplay in games like Starcraft or Age of Empires, one would simply have to spend extra time to develop a scenario where things aren’t inherently equal, but still challenging and equally likely for either side to accomplish. This is actually executed in the single-player campaign mode for many of these games, where starting conditions for the player are drastically different than their AI counterparts. Why isn’t the asymmetry found in the single-player mode found more prominently in multiplayer instances? I think you did a good job touching on many of the reasons why that isn’t the case, but let me offer one more: In a competitive environment, a player is rewarded for winning a symmetrical game by their skill alone, as both players began with the same resources and one person prevailed. It is much easier to call one person a superior player when starting and potential resources are identical, and being crowned “superior” is the primary aim of a competitive game. I’m not sure what place competitive asymmetry has, but I’m also looking forward to somebody tackling the problem. You raise a good point about the single player mode in Starcraft, because I definitely would call that asymmetrical. Of course, if you gave a human player control of the AI team in almost any single player scenario, they would trounce the standard player in a matter of minutes. The vast inequalities between the two sides of a single player scenario are generally overcome by simply placing constraints on the AI, such as preventing it from attacking for a certain amount of time or only allowing certain units to attack. This gets back to the difficulty in balancing asymmetrical games. As for competitive asymmetrical games, it’s an interesting idea. As I mentioned, abstract games like chess are kind of geared toward the competitive aspect, but I suppose a well-balanced game like Axis & Allies could be competitive, though it would be a bit more complicated. For instance, it takes a very different kind of skill set to be a good Russian player than it does to be a good British player. One asymmetrical board game that could use a quality video-game treatment is Games Workshop’s “Space Hulk”. It has been made into a couple of very poor video games but, if done well, could really present a great asymmetrical multiplayer experience. It’s not historical, but who doesn’t like leading a team of genetically modified superhumans into a massive derelict vessel to kill aliens? I think Space Hulk is another good example of the “elite vs many” style of asymmetrical balance like you find in Hnefatafl where one side has far more pieces and a better starting position, while the other has fewer troops, but a simpler objective. I also think it’s also interesting that even though there have been several computer versions of Space Hulk, as far as I know, none of them were two player games like the tabletop version. It’s interesting that even for a game that supposedly already has balanced rules for asymmetrical play, videogame designers still generally choose to move away from having two players and simply balance the game through AI constraints, as in most one-player campaigns. You might want to consider broadening the definition of “asymmetrical” to include more than the force balance and unit capabilities. Some of the most interesting wargames published recently include asymmetrical goals, which lead to some very interesting situations. The best example is Andean Abyss, in which the factions (the Colombian government, the FARC rebels, the drug cartels, and the right-wing AUC militias) have very different victory conditions. Not only do they make the game more challenging, but the varying goals do a good job of explaining the nature of the conflict. For instance, as the government, you can kill a lot of FARC guerrillas, but if the FARC succeeds in kicking out the government’s support across the country, it’s game over for you. I definitely agree with you, Tom. In fact, I would argue that what makes Hnefatafl (and to a lesser degree, Space Hulk, which was mentioned above) asymmetrical is the differing goals between the two sides. 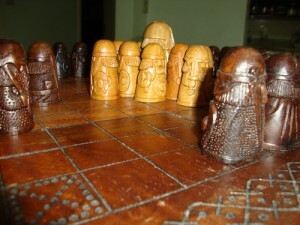 The players’ pieces on both sides are the same, with the exception of the king. If it were a matter of being the last man standing, the Swedes would lose every time. However, the Swedes don’t have to actually win the battle to win the game, their victory condition is simply to get the king to safety. The Muscovites can completely annihilate their army, but as long as the king escapes, it’s considered a win. The asymmetrical aspect in Axis & Allies mostly comes from force balance, but goals are important, too. There are actually two ways to win the game, by taking a certain number of enemy capitals or achieving a certain level of industrial production. In theory, either side can shoot for either goal, but in practice, they are more suited to one side or the other. Although Moscow is certainly the easiest capital to take, the Axis has a hard time with the other two, so generally (in my experience, at least), the Axis wins through production. The Allies start out with more land, so it’s hard for them to increase their production enough for that goal. For them, it’s always a rush to take Berlin and Tokyo. Thanks for bringing up this point. Goals are certainly a major aspect of asymmetrical play, and one that I probably could have emphasized more. Rather late reply, but I’ve seen the folk style of game called Fox and Geese in England with a single fox and a gaggle of geese chasing them. For what it’s worth, a classic modern asymmetric example of play is counterstrike, particularly the VIP mode. Thanks for stopping by, Matt. Counterstrike VIP is similar in many ways to other first-person and action type games with asymmetrical Co-op, like Jet Force Gemini and even Mario Galaxy. These tend to be more in the way of “Hero and Sidekick” games, which are certainly asymmetrical, but not quite as interesting (or fun) as games like Axis & Allies. I think what sets Counter-Strike and the VIP mod apart from these is that it’s not just asymmetrical for the teammates of the VIP, but for the opposing players as well. It actually brings the rules of the game closer to Hnefatafl, making the VIP less like a sidekick, and more like the Swedish King. The major difference is that here each player controls one character, rather than two players each controlling a whole team. I find it interesting that asymmetrical play has found its way into more first-person games where you control a single character, rather than more strategic games, like Fox and Geese, where you control a whole team of pieces/characters. It could be that these game designers are drawing less off of asymmetrical board games for inspiration, and more off of other traditional games, like tag and kick the can (though this is just speculation on my part).